The somewhat poetic designation of Bridegrooms of the Law and of Genesis are given to the persons called up in the synagogue to the reading of the chapters ending and beginning the Pentateuch respectively (Deut. xxxiii. 27-xxxiv. 12; Gen. i. 1-ii. 3). This takes place on Simḥat Torah, or the Rejoicing of the Law festival, which is the second day of the Shemini 'Aẓeret, or Eighth Day of Solemn Assembly, in those communities in which the second-day festival is observed. It is considered a privilege to be the one to whom the concluding or the opening portion of the Law is read; and those persons upon whom the choice of the congregation falls are esteemed as specially honored. The honor of the bridegroom of the Law is greater than that of the bridegroom of Genesis. Other privileges are conferred upon the recipients of these dignities in order to increase the distinction of their station. They are not called to the Law by the ordinary formula, "Ya'amod" (Let N. N. arise)—which is otherwise used—but by a special, poetic invocation, beginning (in the Ashkenazic ritual) with the words ("by permission of the great, almignty, and tremendous God") for the Ḥatan Torah; and ("by permission of Him who is exalted above all blessing and song") for the Ḥatan Bereshit. 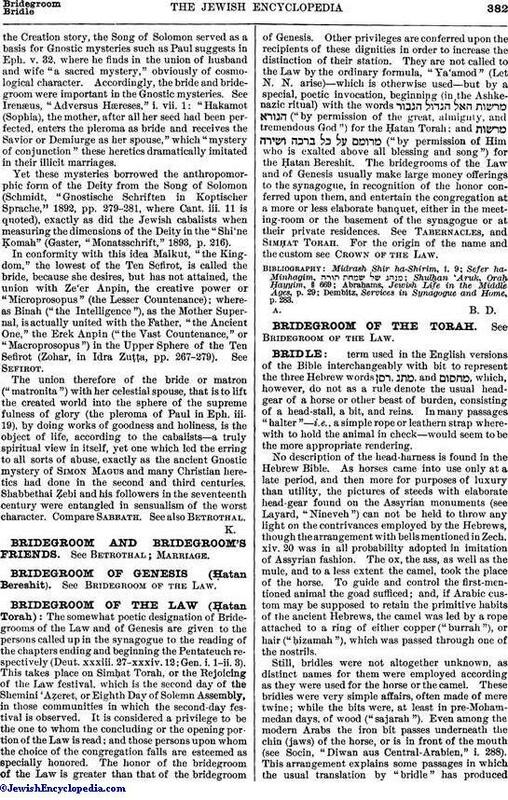 The bridegrooms of the Law and of Genesis usually make large money offerings to the synagogue, in recognition of the honor conferred upon them, and entertain the congregation at a more or less elaborate banquet, either in the meeting-room or the basement of the synagogue or at their private residences. See Tabernacles, and Simḥat Torah. For the origin of the name and the custom see Crown of the Law.